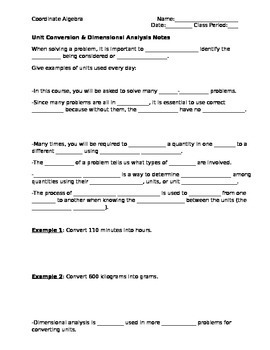 Fill-in-the-blank notes on converting between units using dimensional analysis. 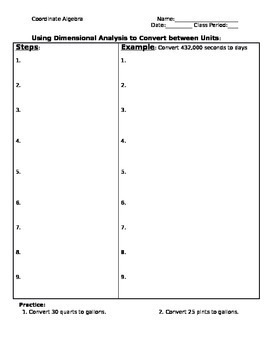 Notes include step-by-step directions on setting up proportions to convert between units. Students typically struggle with the concept of dimensional analysis. Throughout the years, I have adjusted my method of teaching this concept and this method used has been amazing! These notes serve as a great outline for a discussion on converting between units. Created for students who have difficulty keeping up with note-taking in class and poor handwriting.